Staff Sgt. Jeremy Daniels makes his way inside his temporary residence in San Antonio. 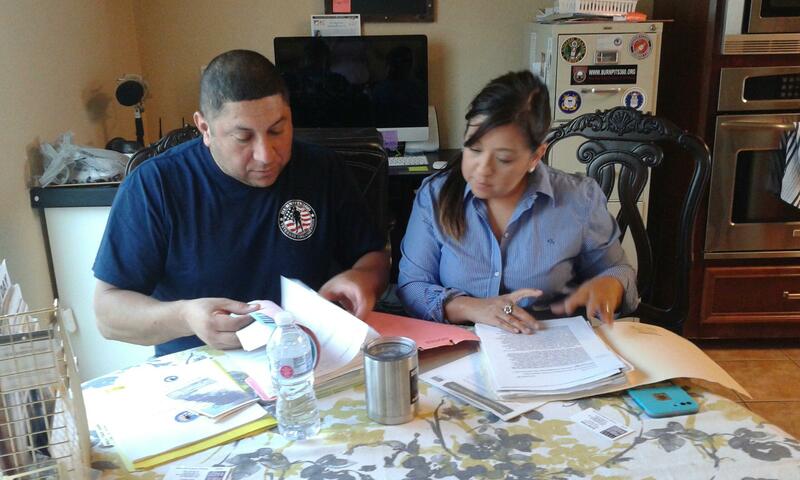 LeRoy and Rosie Torres review medical records at their home in Robstown, TX. Army Reserve Capt. LeRoy Torres will never forget the 10-acre plot of land, full of burning garbage, located about a mile from his sleeping quarters at Balad Air Base in Iraq. The year was 2008. All the military’s waste was thrown into the pit, doused with a jet fuel known as JP-8 and set on fire. At the height of its activity, the Balad pit burned about 200 tons of trash each day. The smoke it gave off was overwhelming, especially when the wind blew a certain way. It stuck to people’s clothes, filled their lungs and got in their eyes. LeRoy Torres agrees. “There were times—I remember one time clearly—I couldn’t even see the road 6 feet in front of me,” he said. Soon after they arrived at Balad, both Torres and Daniels got sick. Torres started coughing up a black mucus that military doctors called ‘Iraqi Crud.’ It was the result, they said, of his body getting used to the environment in-country. Daniels developed fourth nerve palsy, a neurological disorder that affects vision. After that, Daniels developed a weeping rash on his lower extremities that didn’t resolve for months. The skin sloughed off and bled. Doctors suggested that he was allergic to his laundry soap. After they returned home, the issues got worse. Torres’ respiratory problems were given a name: constrictive bronchiolitis, an untreatable and often fatal lung injury. Daniels' neurological problems were labeled ‘relapsing multiple sclerosis’ with an ‘extremely aggressive onset.' He now uses a wheelchair. Both men were medically retired from their jobs. They both blame the burn pits for their health problems. Hundreds of burn pits were scattered across Iraq, Afghanistan and Djibouti. The use of open burn pits continued unrestricted until 2009, when United States Central Command issued comprehensive burn pit guidance. By the end of the decade, the Department of Veterans Affairs grappled with an influx of disability claims related to toxic exposures from the burn pits. 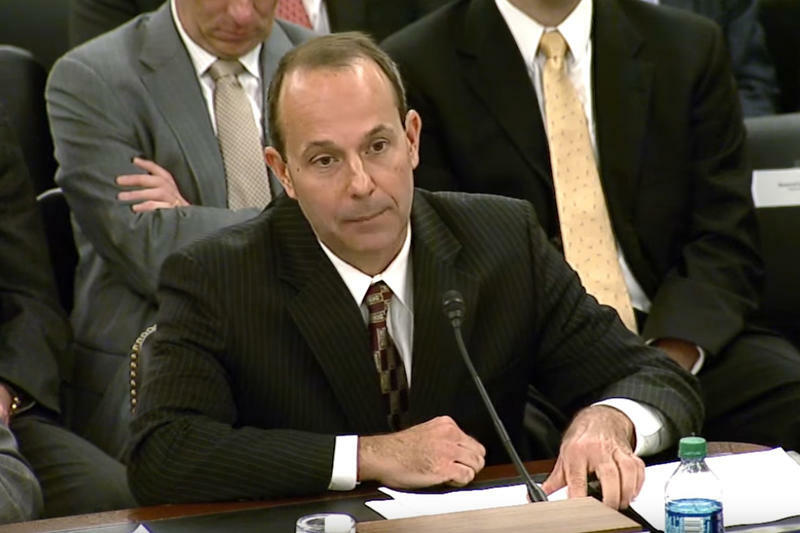 Kerry Baker was the Chief of Legislative and Policy Staff for VA’s Compensation Service at the time. He now works as a VA appellate practitioner. To fix that, Baker helped publish a 2010 VA training letter on potential environmental hazard incidents, including burn pits. The letter lists DoD air sampling results taken at Balad Air Base in 2007. A swath of carcinogenic chemicals and dioxins were released as byproducts of burning trash. One of them is similar to Agent Orange, the defoliant that made soldiers sick in Vietnam. Capt. Torres,’ wife, Rosie, has a copy. She brings it along to all of her husband’s doctors’ appointments. Kerry Baker thinks that’s disappointing since the letter was incorporated into the VA’s claims operating manual. “That tells me that beyond that letter, VA has not done anything since to really educate its people on the subject," he said. But research in this area is challenging. Given that so many different items were burned in so many different places, creating a framework for studying the burn pits has been all but impossible. A study by the Government Accountability Office last year found that the Department of Defense “needs to fully assess health effects” of open burn pits. The VA currently administers a national burn pit registry where veterans can fill out a questionnaire to report exposures to airborne hazards. However, veterans often do not complete the survey. It also does not permit death entries. Add to that the problem of other exposures that soldiers face: sand and dust naturally present in the air, pollution, IED explosions and fires. That cone of uncertainty has a cost. Many veterans struggle to document their exposures in a way that’s sufficient to get VA compensation. Some vets are told that their symptoms are psychosomatic, or the result of milder conditions. Jeremy Daniels believes that this amounts to systemic denial. “I'm not a doctor, but I'm going to say that the Army and the VA want to create their own narrative as to what's wrong with people,” he said. 2017 has been a year of setbacks for those who suffered as a result of the burn pits. The Texas legislature failed to pass a bill that would have created a burn pit registry to collect health data and provide affected veterans with a way to connect with one another. The bill was opposed by a group called Texans for Lawsuit Reform, which expressed concern that a public registry would be used as a tool for class action lawyers to recruit new clients. In July, a federal judge dismissed a class action lawsuit against Kellogg Brown and Root, the Houston-based contractor in charge of the burn pit at Balad. He said that the company acted on behalf of the U.S. military and couldn’t be held liable for soldiers’ illnesses. Capt. LeRoy Torres was part of that lawsuit. His wife Rosie said that he’s barely talked about the defeat. Veterans and their families are growing desperate for accountability. Rosie Torres says that if Kellogg Brown and Root isn’t held responsible, the government needs to pick up the slack. “If they're not gonna hold them [KBR] accountable, then the federal government should step up and take care of these soldiers that are dying. Take of them, take care of the Gold Star families, their widows, their children that are being denied benefits time after time after time,” she said. The Torres family has funneled its frustrations into a nonprofit called Burn Pits 360, which acts as a source of information and support for vets. Burn Pits 360 went before Congress earlier this year to spread awareness about the issue. Texas Congressman Joaquin Castro has helped in their cause, co-sponsoring the Helping Veterans Exposed to Burn Pits Act, which would create a VA Center of Excellence in the prevention, diagnosis, mitigation, treatment, and rehabilitation of health conditions related to burn pit exposure. On Oct. 26, Rep. Castro requested a Congressional hearing on the issue. “I really believe, after looking at everything that this could be the equivalent of Agent Orange in Vietnam, where, for a while, people were ignored or not believed even though they were exhibiting symptoms,” Rep. Castro said in an interview. Despite these glimmers of progress, Staff Sgt. Jeremy Daniels said he feels discouraged. He has traveled widely over the last year, seeking out different VA hospitals and trying to get the support of political advocates. A previous version of this story reversed the order of the onset of Jeremy Daniels health issues. (He first developed vision problems, then a rash). It also incorrectly stated that open burn pits were only used until 2009. Health and environmental complaints led to U.S. laws restricting burn pits in Iraq effective at the end of 2010. The burning continued unrestricted in Afghanistan for a period after that. In June 2016, officials with the Department of Defense told the Government Accountability Office that there were no military-operated burn pits in Afghanistan and only one in Iraq, of which Congress had been notified. Post-Traumatic Stress Disorder (PTSD) has a reputation for being difficult to treat, especially in active duty military and veteran populations. That may soon change, according to research findings shared Wednesday at the 2017 San Antonio Combat PTSD Conference. Kevin Ziober says he was illegally fired because he served in Afghanistan. His employer is forcing him to take his complaint to binding arbitration, rather than to court. 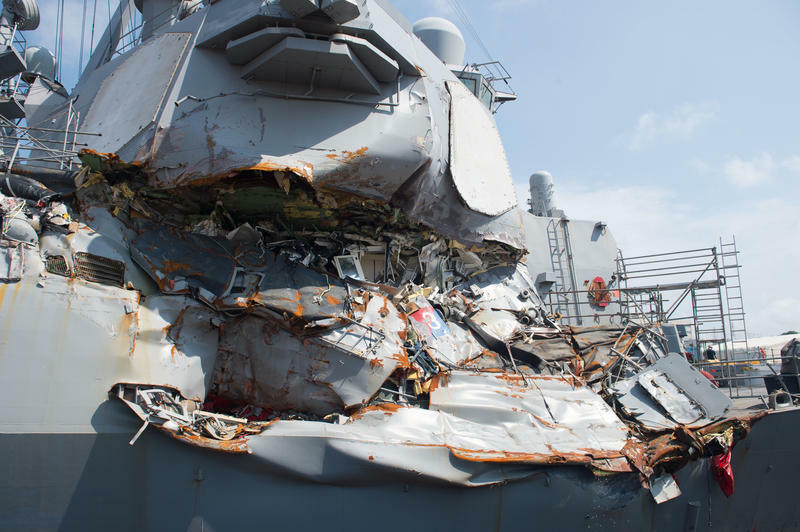 Human error is likely to be among the causes of two separate collisions involving Navy destroyers. The accidents killed 17 sailors. In the Vietnam War era, Americans became more interested in recovering missing troops -- largely because of the activism of some military families.